It might seem like an epic shift of direction for filmmaker Steve McQueen to tackle a big blockbuster heist film after his searing Oscar-winning drama 12 Years A Slave. But McQueen has crafted a smart, female-centred, multi-racial action-thriller which is also, hands down, one of the most entertaining films of the year so far. "...one of the most entertaining films of the year so far." Taking Lynda LaPlante’s 1983 British TV series as its inspiration and adapted for the big screen by McQueen and Gone Girl author Gillian Flynn, this is a story of survival and revenge. The film opens with scenes of domestic bliss between devoted husband Harry Rawlings (Liam Neeson) and his wife Veronica (Viola Davis). The Rawlings, on the surface, seem to have it all: a strong marriage, affluent lifestyle, and happiness. But when criminal mastermind Harry and his entire crew are killed in a botched robbery, their wives are left in shock and desperate financial circumstances. Faced with threats from both a rival gang and the political elite her husband was in cahoots with, Veronica has no choice but to try and finish the job Harry started. She enlists the help of two women she has never met before: Linda (Michelle Rodriguez) and Alice (Elizabeth Debicki), the other widows left behind by the original failed heist. With no criminal experience, these women start to put together their own plan which will either save them or send them straight to jail. Davis, Rodriguez and Debicki are all terrific and they are joined by some very fine actors in supporting roles including Colin Farrell, Daniel Kaluuya, Brian Tyree Henry and the wonderful Robert Duvall. 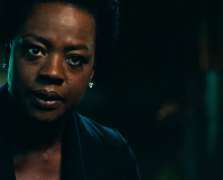 Shot with panache and style, Widows is a cool thriller where every character is fully fleshed out and every superbly edited action sequence has a purpose. McQueen has achieved what he set out to do – bring diversity onto our screens – and in the process has created a superb film that all audiences will appreciate.